Cross-posted at my Star Tribune blog. Sir Ernest Shackleton is widely studied for courage and leadership. He led his crew of sailors to safety over a two year journey when their ship was stranded on the Antarctica ice in 1915. The story was immortalized in Alfred Lansing’s book Endurance. Wild Bill Cooper of northern Minnesota has not received such attention. He led a snowmobile expedition in 1972 which was supposed to travel from Minnesota to Moscow and back via Siberia and Russia. They didn’t make it, but did get to Greenland eventually. Then Cooper turned to drug smuggling and ultimately disappeared off the face of the Earth. Duluth filmmaker Mike Scholtz has immortalized the man and the trip in a new documentary, Wild Bill’s Run. Wild Bill is the anti-Shackleton, and Wild Bill’s Run the anti-Endurance. There are no heroics here, but there is plenty of adventure. The film has gained accolades since it was released — it’s currently on tour with the prestigiousBanff Mountain Film Festival, and I finally saw it when it was shown on Outside magazine’s websiteyesterday. A paean to the ‘70s, Minnesotans, outlaws and an adventurous spirit, it glows with glorious 16mm film footage, paired with wry interviews with some of the surviving members of the expeditions, and Cooper’s family. Cooper was not one to play by many rules. The expedition starts with his handgun being confiscated when the group crossed through customs into Canada. They more or less steal fuel at one point, and get in trouble when they enter Greenland without any permits. Flying marijuana from Mexico to Minnesota was lucrative work and Cooper allegedly had 17 planes in the “Marijuana Air Force” the FBI says he operated. And then he disappeared. The most likely explanation is that he was killed over drugs or money, but that hasn’t stopped other explanations, including that he is still out there somewhere. The chance that the fame-loving Cooper might just show up at a screening of the film about himself should be enough reason to go see it when you can. But the more reliable reason is that it’s a funny tale of adventure and intrigue and wilderness, Cooper every bit a character from the Nixon era as Shackleton was a contemporary of Teddy Roosevelt. This film, borrowing its name from one of Snyder’s most eloquent non-fiction books, revolves around a life-long conversation between Snyder and his fellow poet and novelist Jim Harrison. These two old friends and venerated men of American letters converse while taking a wilderness trek along the central California coast in an area that has been untouched for centuries. They debate the pros and cons of everything from Google to Zen koans. The discussions are punctuated by archival materials and commentaries from Snyder friends, observers, and intimates who take us through the ‘Beat’ years, the years of Zen study in Japan up to the present — where Snyder continues to be a powerful spokesperson for ecological sanity and bio-regionalism. You can keep up-to-date on the film (and hopefully showings around the country after its premiere in San Francisco in May or at least a DVD release) by becoming a fan on Facebook. It also appears that there is a book coming out to accompany the film, The Etiquette of Freedom: Gary Snyder, Jim Harrison, and The Practice of the Wild. 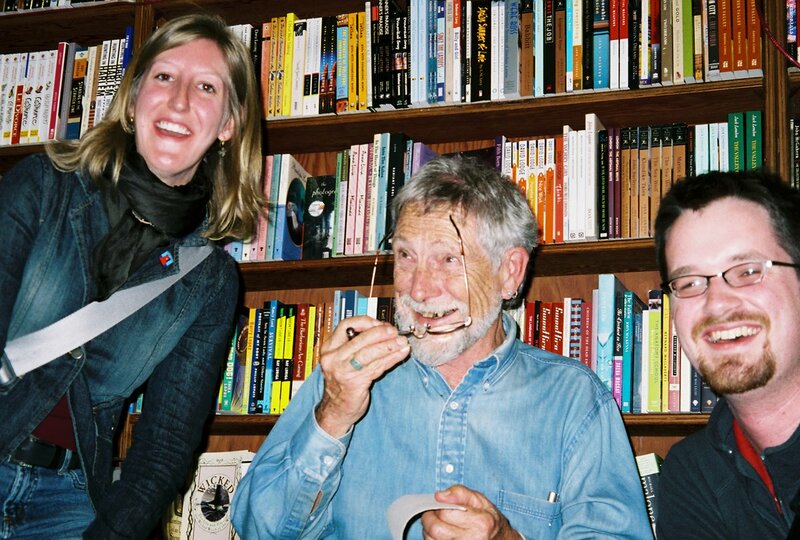 Read about the time Katie and I met Gary Snyder on our honeymoon in San Francisco. Sam went to the Banff Film Festival last night in Bozeman and alerted me to a movie that he thought would be up my alley. “Finding Farley” is about a young couple and their two-year-old son’s journey across most of Canada to visit legendary writer and ecologist Farley Mowat (“Never Cry Wolf”). The family travels most of that way by canoe. It looks like a lovely flick about family, wilderness, writing and understanding the natural systems we live in. It won this year’s Grand Prize at the festival. I first saw the film “Never Cry Wolf” when I was a kid. Revisited it again a few years ago and enjoyed it thoroughly. It’s as funny as it is a study of place and the wolves that live there. I read the book on a BWCAW trip a couple years ago and, though it was enjoyable, this is actually one instance where I think I enjoyed the film more. But both are great works about the Arctic, wolves, and man’s relationship with the land. 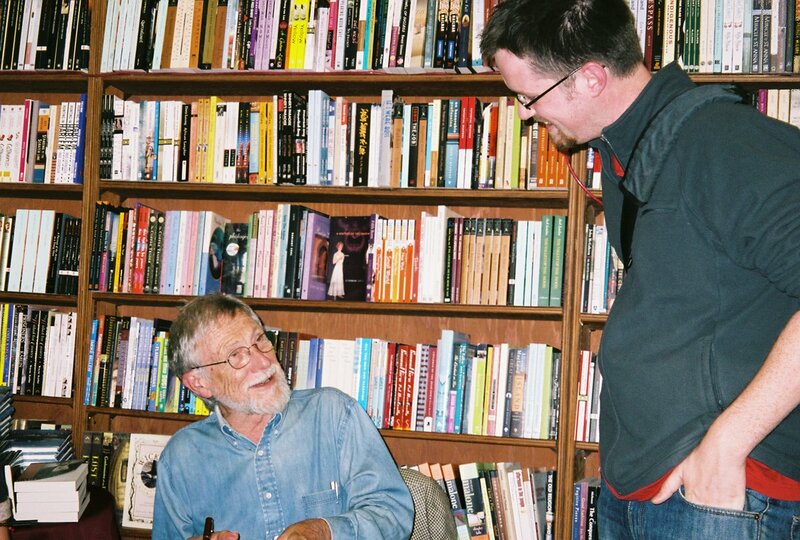 I bought my copy of Jack Kerouac’s novel “Big Sur” at City Lights Bookstore when I visited San Francisco in 2006. I then proceeded to read it during a camping trip down to the namesake region of the California coast with my friends Zack and Steve. It’s a dark book about Kerouac’s struggles with fame and alcohol. In it, he is plagued by hangers-on and wannabes; the “King of the Beatniks” can find no relief in the wake of the publication of “On the Road.” It can be argued that Kerouac never really recovered from the publication of that book and the demons he confronts in “Big Sur” led to his alcoholism-related death in 1969. My own trip down to Big Sur was more about camping in the redwoods and hiking at a state park than suffering through delirium tremens, but it was poignant to read the book near where it was written. And I heard the song of the crashing waves that Jack famously meditates on in the book. The film looks like the typical talking head thing, but with some pretty good heads: Tom Waits, Sam Shepard, and Lawrence Ferlinghetti, to name a few. Also, through digging around the film’s website a bit, I learned that the guy who played restaurateur Artie Bucco on The Sopranos is also a Kerouac “interpreter” (he provided voice-over work on the documentary). Seriously, this isn’t Coen brothers?